Congratulations on taking the time to learn more about the science behind Noise Colors! Each of the Noise Colors recordings use special sound frequencies to block out background noise - helping to enhance your focus and concentration, and assisting in the relaxation process. 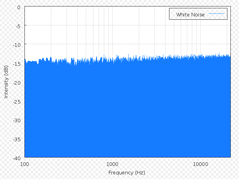 White noise acts as an incredibly beneficial "sound shield." White noise help to stop sound distractions from hitting your ears, or stop sounds (such as private conversations) from hitting other people's ears. To activate the power of white noise, all you have to do is play it. For example, if you live in a busy part of the city, you may play white noise as you fall asleep, to help block out noises from outside. Or if you are having a private conversation in an office, you can play white noise to mask the sounds from others and help keep the conversation private. Another huge benefit of white noise is to assist with focus and concentration. By listening to white noise recordings while you work (with or without headphones), you naturally block out all distractions and find yourself more focused on your work. It's been termed a "productivity miracle" and white noise is used for this purpose daily by tens of thousands of individuals across the globe. White noise was first discovered in the late 1800s, as scientists such as Thomas Alva Edison began conducting experiments on sound and sound frequencies. They soon discovered the full spectrum of sound frequencies (similar to the spectrum of light, ie. the rainbow), and these findings made way for the tube phonograph, certain parts of the telephone, and other early audio devices. It was later discovered that by effectively playing all of the noises in the audible spectrum, you create what was to become known as "white noise" - a special sort of sound that helped block out distractions. This simple discovery was found to have very practical benefits in the real world, such as helping individuals focus on a task, or fall sleep in distraction-ridden environments. Since those early days, and with the advent of more modern and sophisticated audio technology, white noise recordings have moved significantly forward. Further research into the audible spectrum has led scientists to produce precise mathematical algorithms for generating white, pink and brown noise - all noise-masking variants with slightly different sounds. These audio recordings are used today to help enhance concentration, focus, relaxation and exlude anoying ambient noise. The Noise Colors website stand at the forefront of that technology, helping thousands of individuals to block out distractions - and take control of their audible environment. The term "white noise" was created to be analogous to white light. Since white light contains all light frequencies in equal proportions; white noise is intended to be similar in that it contains all sound frequencies (in the range of human hearing). 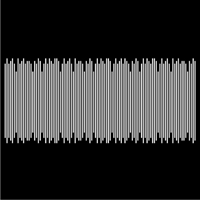 White noise is created by generating random frequencies in equal proportions per octave, typically using a special mathematical computer program. Every octave is double the size of the previous, which increases the high frequency content. The result is a powerful recording that effectively helps to block out background noise, by effectively overwhelming the ear with every possible sound it can hear. It sounds chaotic, but is in fact quite relaxing. Imagine listing to a hall full of 1000 people talking. The brain is no longer able to tune in to any one conversation, and effectively zones out and treats it as a soothing background noise. That's precisely what happens with white noise. There are three core 'colors' of noise - white noise, pink noise, and brown noise. All of these effectively deliver the same result, however are produced using slightly different mathematical models, which result in recordings that sound different. Certain colors may be more suited to certain applications: brown noise is a deeper sound, for example, which may be better for those looking to get to sleep. For productivity, focus, concentration, tinnitus and ADHD assistance, try White Noise. For intense concentration, soothing headaches, and calming children, try Pink Noise. For deep sleep, relaxation, and quiet focused reading, try Brown Noise. Remember however: the noise recordings all perform the same task. It's all down to which sounds you prefer for the task in hand. Each of the Noise Color recordings has been professionally produced to the very highest standards. They make use of the latest white noise technology to help you reach states of concentration and relaxation you might never achieve otherwise. Noise Colors is an all-natural solution for blocking out background sounds and switching on your personal productivity - all simply by hitting the play button! Got questions? Check out our Noise Colors FAQ!